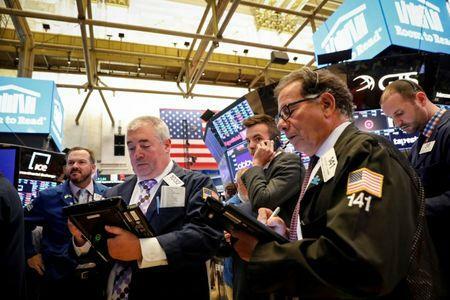 NEW YORK (Reuters) - The U.S. dollar weakened, long term Treasury yields rose and stocks closed mostly lower on Friday after President Donald Trump complained again about the greenback's strength and about Federal Reserve interest rate rises. Wall Street and European stock markets stalled, despite good corporate earnings, after Trump threatened to impose tariffs on all U.S. imports from China. Trump repeated his criticism a day earlier of the U.S. Federal Reserve's policy on raising interest rates saying he is concerned the central bank will raise interest rates twice more this year, a White House official told CNBC. The U.S. dollar fell the most in three weeks against a basket of six major currencies, halting a rally that had driven the greenback to a year high. “The dollar is an important issue today especially because we have been on a rise for quite a long time,” said Randy Frederick, vice president of trading and derivatives for Charles Schwab in Austin, Texas. The dollar index fell 0.77 percent, with the euro up 0.74 percent to $1.1727. Benchmark 10-year U.S. notes last fell 14/32 in price to yield 2.8968 percent, from 2.847 percent late on Thursday. The long end of the U.S. Treasury yield curve, which reflects sentiment about rising inflation and the health of the U.S. economy, saw the biggest one day jump since May while short-dated maturities held steady. Microsoft shares rose, supporting stock indexes after a strong earnings report late Thursday, while General Electric shares sank after the conglomerate cut a key financial target. In the latest trade salvo, Trump said he was ready to impose tariffs on all $500 billion of imported goods from China. The pan-European FTSEurofirst 300 index lost 0.15 percent, amid rising trade tensions. European auto shares, sensitive to trade tensions as U.S. officials work toward slapping tariffs on car imports, fell 2.1 percent. MSCI's gauge of stocks across the globe gained 0.37 percent, helped by Asian markets. Oil prices rose as a weakening dollar and lower expected August oil exports from Saudi Arabia supported the market. But concerns about U.S.-China trade tensions and supply increases meant oil prices saw their third weekly loss. U.S. crude settled up 1.44 percent at $70.46, while Brent settled at $73.07, up 0.68 percent.